The aircraft maintenance and management of aircraft continued airworthiness of the own company and their customers is performed by the separate AIR «URGA» subdivision – Aviation Engineering Service. AIR «URGA» Aviation engineering service has a Certificate PART-145 № UA.145.0002 issued by CAA of Ukraine. Maintenance is conducted in a modern hangar type building. The maintenance system meets the international standards of quality management system ISO 9001:2000. We perform basic and line maintenance for aircraft of all types operated by the airline at the main base (Kirovograd), as well as at external operating bases. In addition, our aircraft maintenance base allows us to perform maintenance for other types of aircraft, namely ATR-72, Boeing 737-500, etc. Reliability, timeliness and effectiveness of maintenance are confirmed by numerous distinction certificates from the UN missions management. 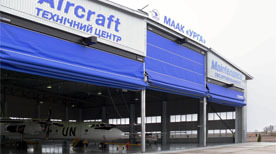 As a part of the next investment project AIR «URGA» established a Technical center, which is a set of additional facilities, equipment and cutting-edge docking hangar that meets the current requirements for aircraft maintenance organizations. Maintenance is conducted by the certified engineering and technical personnel who have undergone the appropriate training, including from foreign experts. The airline also provides the flight information transcript for An-24, An-26, Saab-340B aircraft with registrars like: МСРП-12-96, ЭБН-12, БУР-4, ЭБН-4700, К3-63.